A farmer harvesting choko sprouts in Chiang Mai, Thailand. Photo: Peter Barrett. 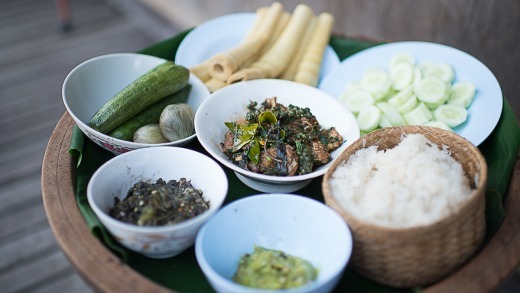 Peter Barrett takes a culinary tour of northern Thailand. Thick, charcoal smoke is beginning to fill the small, wooden room. 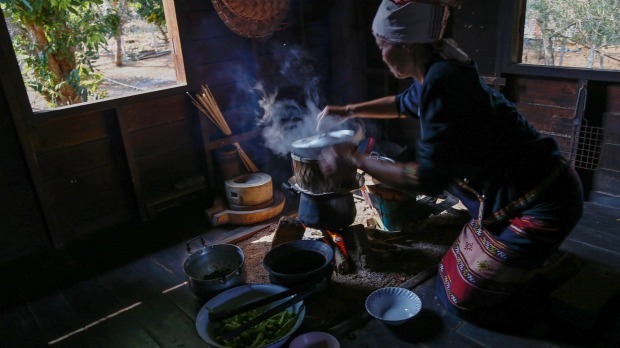 Tending an ancient-looking clay oven – essentially a bowl of ashes sitting on a gravel tray catching errant sparks – is a cheerful woman dressed in elegant, traditional clothes of northern Thailand. Next to her, and watching every move, is top Australian chef Peter Gilmore, of Sydney’s Quay and Bennelong restaurants. I am watching too, fascinated by the dish she is preparing but more distracted by the fact that the house we are in – perched on stilts in a remote farming village in northern Thailand – is built almost entirely out of teak. I’m hoping this meal won’t be our last. Hot stuff: Cooking with charcoal. Photo: Peter Barrett. 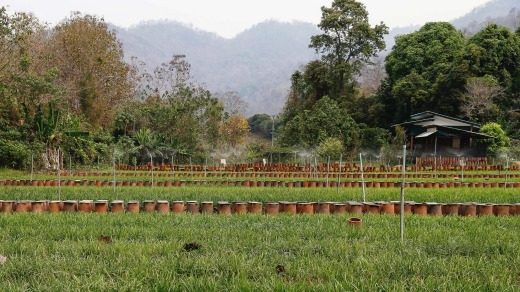 Gilmore and I are here learning about the Royal Project, an initiative that fights deforestation and poverty in Thailand’s Chiang Mai province by encouraging farmers to grow edible crops instead of heroin poppies. Founded by His Majesty King Bhumibol Adulyadej in 1969, it’s ballooned into a network of 38 research stations experimenting with more than 2000 different crops. The knowledge is then passed on to local farmers who sell their produce back to the Project at fixed prices, providing a stable, reliable and legal income. Surprisingly, a lot of the food grown is actually European (think Italian basil, rosemary and cabbages), thanks to the region’s altitude and cooler climate. As the fire crackles away merrily it becomes clear we are in more danger from smoke inhalation than immolation. 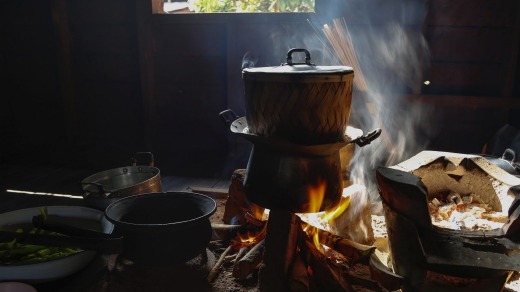 But carcinogenic charcoal cooking is much less common in Thailand today and the woman, who runs a nearby noodle restaurant, says she usually cooks with gas. For today’s dish she slaughtered a “house chicken” (an unlucky chook from downstairs), cut it into small pieces and then half-roasted, half-steamed it in a curry paste of Thai herbs, chilli, garlic and ginger. At the end she adds fresh herbs and presents it with sticky rice, steamed marrows and Nám prík nùm, a much-loved Northern Thai spicy salsa made from long green chillies that have been roasted, skinned and mashed with shallots and garlic. Gilmore and I are travelling with two other top chefs: Heston Blumenthal’s right-hand man, Ashley Palmer-Watts, and Joan Roca, chef-owner of El Celler de Can Roca in Spain, currently No.1 in the World’s 50 Best Restaurants list. While the cuisine here in the north is generally known to be less spicy and more focused on seasonal produce than southern Thai cooking, we are quickly learning that the history of Thai cooking is about adaptation. For example, chillies – a hallmark of Thai cooking today – were introduced as late as the 17th century by Portuguese missionaries. Chiang Mai is known for its cooking schools, slightly cooler weather and bucolic farmland, and driving the mountain roads here is spectacular. I watch a curious mix of lush tropical undergrowth and bananas whizz past, blurring into deciduous trees that have lost their leaves thanks to the (albeit mild) December/January Thai winter. Signs for wildlife and elephant riding parks flash by as we wend our way past ubiquitous pick-your-own strawberry farms (hugely popular with southern Thai tourists who regard them as a cozy winter fruit), along with several clear mountain streams, despite the ongoing drought. More than once as we drive our bog-standard white minivan along the curvy, well-maintained roads, it strikes us that a convertible or motorbike would be a lot of fun. One such drive takes us to Mon Jam, a resort popular with southern Thais that is part of the Nong Hoi Royal Project, built 1460 metres above sea level. The sweeping views (although today, shrouded in mist) and beautiful gardens are great but it’s the meal prepared by the local canteen that interests us most. We graze on five or six dishes distinct to the area, including a pork and peanut curry with spice influences from Burma, India and Thailand. 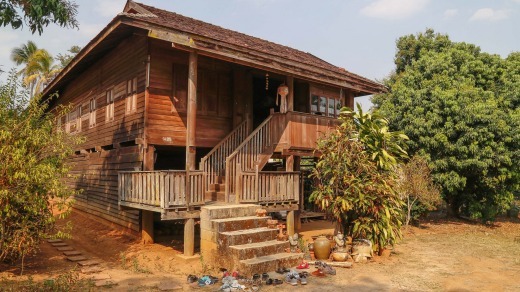 It reflects the diversity and history of this remote, northern Thai area, which over the past 100 years has been a magnet for seven Asian tribes: the Karen, Lahu, Hmong, Lisu, Akha, Mien, and Padaung, each with their own distinctive languages and customs. In a quiet moment our guide, Sei, fills us in on some historical details. In the beginning, he says, the King funded much of the work out of his own pocket. “But as time goes by the Ministry of Agriculture helped fund [it]. There was also, in the beginning, a lot of funding from many countries – some from the [United] States, some from Germany.” While the project has generally been a great success story, according to a recent report in the Bangkok Post it seems poppies – used in the production of banned drugs including opium and heroin – have not been wiped out from the area completely. Our trips ends with a visit to Chiang Mai market, a staggering collection of street foods, such as nam-pla wan (tart green mangos dipped in a spicy sweet relish), fascinating ingredients (deep fried bamboo caterpillars anyone?) and beautiful hill tribe handicrafts. It’s a stark but interesting contrast to the slower life in Thailand’s food bowl mountains of Chiang Mai. 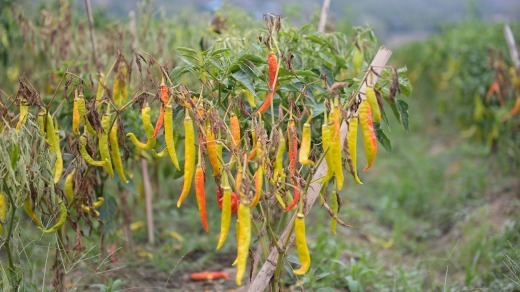 Chillies were introduced in the 17th century. Photo: Thailand Department of Tourism. For resort-style accommodation, Baan Med Bua is about an hour’s drive from the airport and located close to several Royal Project research stations; rooms for two from $95, see facebook.com/baanmedbua. Several cooking courses operate in the Chiang Mai area. Concept Case runs 2.5-hour courses that can include visits to markets and farms. See conceptcaseall.com. A steaming pot of nam prik num. Photo: Thailand Department of Tourism. Peter Barrett was a guest of Thailand Tourism and 50 Best Explores. This story was originally publsihed in traveller.com.au on April 30, 2016.